Dr Bruce Moore Director of Australian National Dictionary Centre 1994 to 2011 Moore edited many of Oxford Australias synchronic dictionaries, including the Australian Oxford Dictionary (1st and 2nd editions), the Australian Concise Oxford Dictionary (3rd, 4th and 5th editions), and the Australian Pocket Oxford Dictionary (3rd, 4th, 5th and 6th editions). Moore is also the author of several monographs, most notably Speaking our Language: the Story of Australian English (2008). 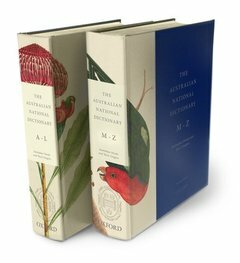 Australian National Dictionary 2e complied at the Australian National Dictionary Centre at the Australian National University under the guidance of Amanda Laugesen the current Director. The Centre, established in 1988, is a joint venture of the Australian National University and Oxford University Press Australia and New Zealand.